I don't know how people live with the mistral or the tramontane down in the south of France. Those winds blow regularly and with greater force that we're seeing up here right now. But the sound of constant wind and wind gusts makes me jumpy. Maybe you get used to it. The average winds at 7h21 this morning where we are (red dot). Our wind comes on the edge of a weather system that is blowing in off the North Atlantic, over the British Isles and northern coast of France. It's a lot stronger up north than here, luckily for us. These systems are normal and we get them regularly, but with much less wind most of the time. The above map shows that the average wind speed this morning where we live is around 30km/hr (just under 20mph). Another map on the same web site shows the gusts to be between 40 and 50km/hr (25 and 30mph). That's not much compared to what they're getting in northern France, Belgium, the Netherlands, and England. But it's still annoying. Just for fun, I converted 30km/hr into light years per hour -- the online converter has an option for light years because, well, for those times when you just need to know. Astronomically speaking, our winds are blowing very, very slowly, at 0.00000000000317106299 light years/hr. That's just slightly faster than 3 trillionths of a light year per hour. ...the forsythia is blooming. This is the big forsythia that I trimmed last spring. I mostly trimmed from the bottom, making the bush less round but leaving it tall. This year, after the flowers fade, I plan to shorten it dramatically. 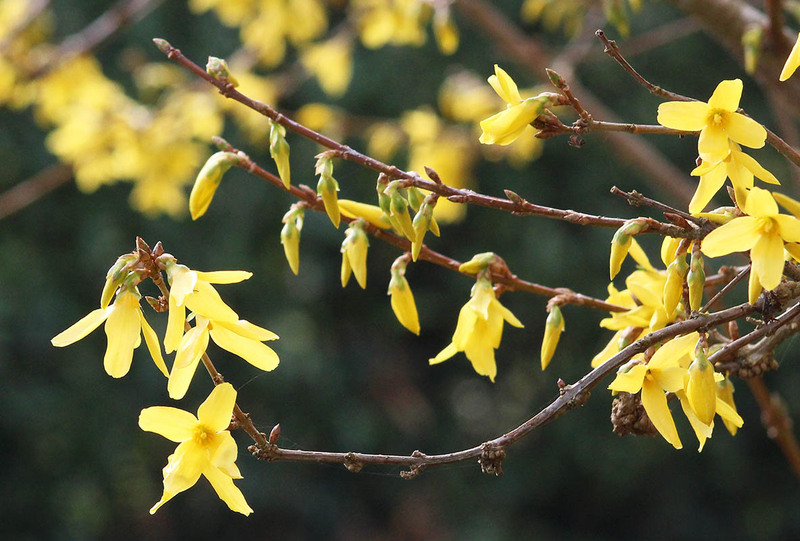 Forsythia on a sunny morning last week. You may remember that last year I cut a second forsythia down to the ground. It was not as healthy as the first one and there was fungus growing on the ground around the stems. Since I cut it, it has come back and is now flowering. It's still very small, so we'll keep and eye on it. If it continues to be unhealthy, I may just dig it out of the ground. Or, at least, try. That's what we are expecting today, but it hasn't really started yet. It's dark (because of the hour change), windy, and overcast, but not very wet. A look at the radar shows the precipitation just to our north. And it's relatively warm at ten degrees (fifty fahrenheit). Film at eleven. Rosemary beetles in the rosemary bushes. I didn't know what kind of beetles these are, but they were messing around in the rosemary bush when I was taking pictures the other day. A quick internet search revealed them to be the common rosemary beetle (chrysolina americana) and are, surprisingly enough, found on rosemary, lavender, and thyme plants throughout western Europe from the Mediterranean basin to the British isles. I understand that this actor, Paul Walker, was killed in a car accident a couple of years ago. Now his last film, the latest in that "Fast and Furious" series, is being released in April. I've not seen any of the movies in that series, but I did hear about his accident back when it happened. Vin Diesel remembers Paul Walker. It's shark-tastic! 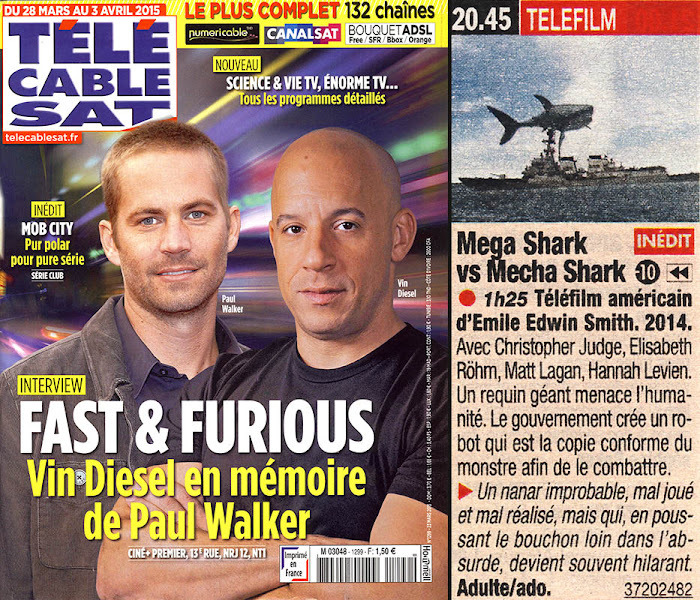 This week's bomb is "Mega Shark vs. Mecha Shark." I just realized as I typed this that "mecha" must be short for "mechanical" as I read that the premise of the film is the construction of a giant mechanical shark to do battle with a giant real shark that threatens the lives of humanity. Mega Shark vs Mecha Shark. American made-for-tv movie. Directed by Emile Edwin Smith, 2014. First showing. With Christopher Judge, Elisabeth Röhm, Matt Lagan, and Hannah Levien. A giant shark threatens humanity. The government creates a robot copy of the monster to confront it. ► An improbable bomb of a film, badly acted and badly directed, but which, in going all the way to absurdity, becomes frequently hilarious. For adults and teenagers over ten. The lizards are coming out to play. It still seems a little cold, but I've seen a lizard or two on the rock walls and the sunny side of the house in recent days. Callie has seen them, too. She likes to flush them out of their hiding places in the rocks and chase them as they scurry away. It's fun to watch as she goes from spot to spot looking for lizards. A lizard clings to the side of the house behind the rosemary bushes, hiding from Callie. If I say the word "lizard" in front of Callie, she'll go into hunt mode, looking in all the familiar places trying to find one. And, if there's one, there must certainly be more. She actually caught a lizard once; it shed its tail, as they do, and got away. You knew it was coming. 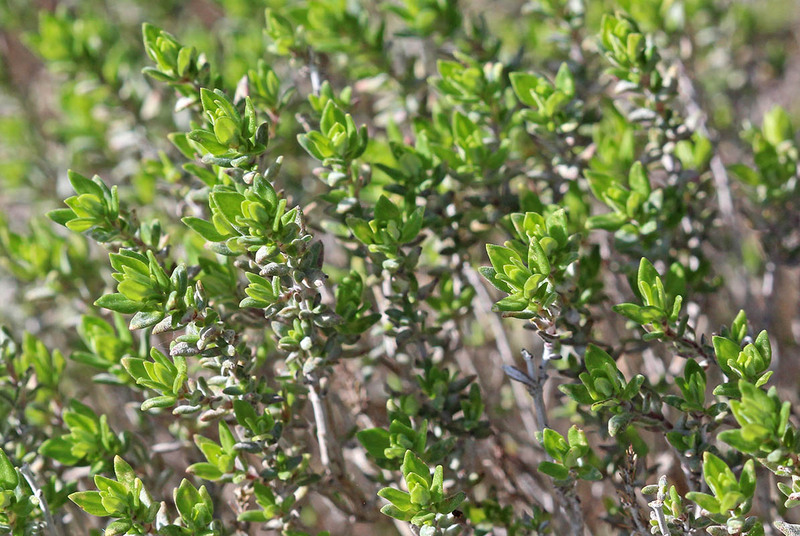 Le thym (thyme) is another Mediterranean herb that does relatively well in our cooler climate. It also is planted on the south-facing wall of the house to maximize warmth and sunlight. Fresh thyme is very good, but we find that we use dried thyme more often because it's easier and just as good. Depends on the dish. Fresh thyme. The brighter green leaves are this year's spring growth. So there are the Simon and Garfunkel herbs. Our garden, like many around us, also has a large laurier sauce (bay laurel tree) the leaves of which we use frequently. I mentioned that I've also grown sarreitte (savory), basilic (basil), cerfeuil (chervil) and, less successfully, ciboulette (chives). Now I'm getting hungry. Can you guess where I'm going with this? We have two tall bushes of romarin (rosemary) growing against the south-facing wall of the house. They seem to thrive there. Early on, I had one growing out in one of the garden plots. It was a centerpiece and I had trimmed it into a topiary. Nothing complicated, just two balls of leaves on a single trunk. One hard freeze was all it took to kill it. Our rosemary is flowering now. That's why we put the new plants against the house. 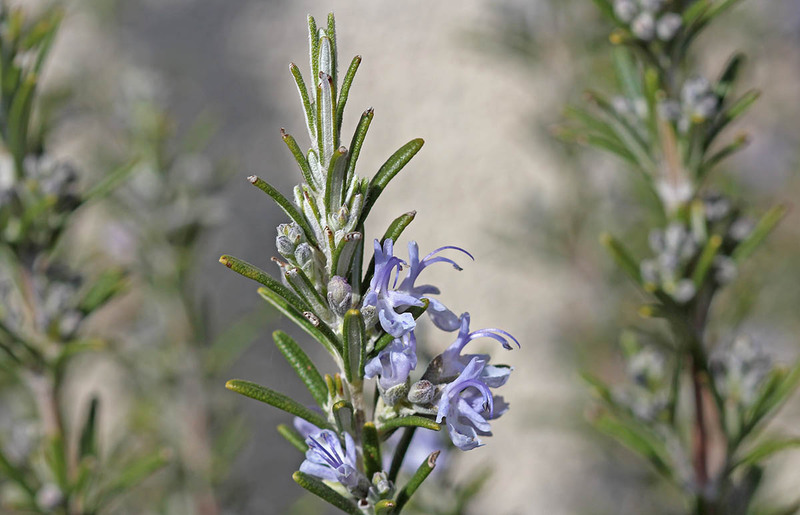 Rosemary likes the Mediterranean climate in the south of France; it's much warmer than our temperate climate. But if you treat it right, rosemary does fine where we live. Compared with parsley, this herb is easy to grow. Well, I should say, it's not easy to kill. This sauge (sage) was already growing in the back yard when we bought the house twelve years ago. Since then I've trimmed it back every year and even taken cuttings and rooted them elsewhere. If anything, it grows too well. Like a weed. Sage in the spring sunshine. 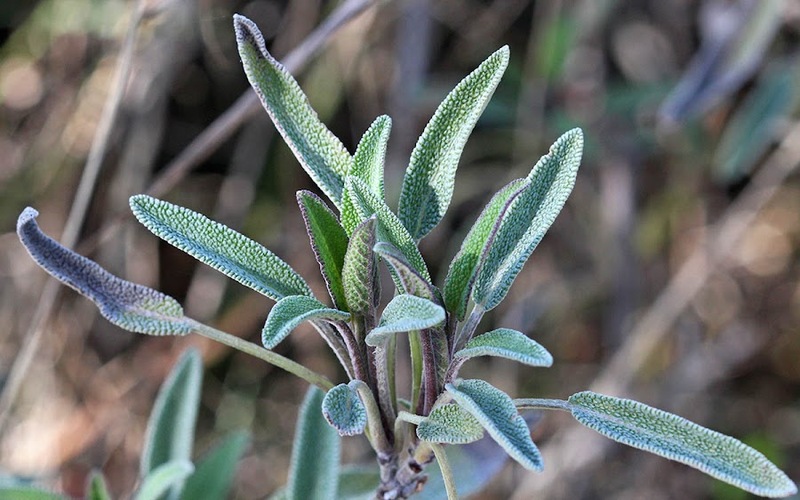 Right now the sage plants are coming back from winter. They never lose their leaves entirely, but spring is when the new growth occurs. As summer approaches they send up their purple flower spikes and then, with fall on the way, the leaves will be larger and broader than they are in the photo, and best for cooking. We use sage a lot with poultry and I add it to winter squash dishes, including my fall pumpkin raviolis. For some reason that I cannot understand, I have trouble growing persil (parsley). Last spring I planted the remainder of a pack of seeds, there must have been between fifty and one hundred of them, and I got one plant. One. Plant. This is that plant, coming back now after dying back for the winter. Flat-leaf parsley re-sprouting from last year's one successful plant. 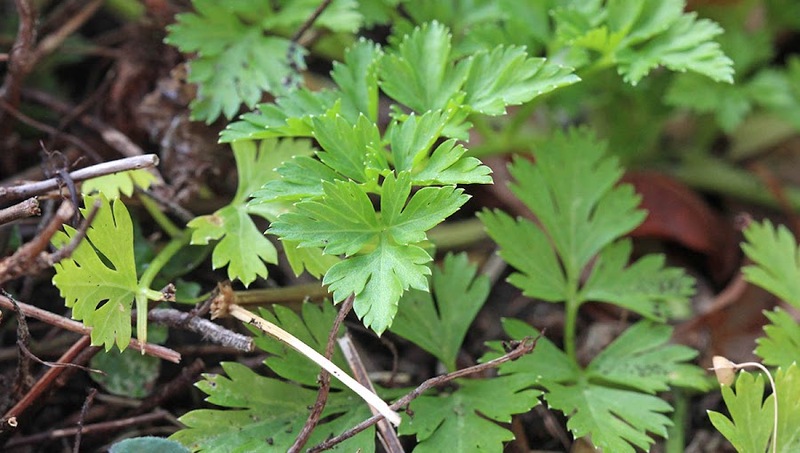 Parsley is supposed to grow like a weed and re-seed itself year after year. I see it in other peoples' gardens all the time. I've seen it growing on rock walls. One of our neighbors has a robust patch growing right out of her compost pile. But I have no luck at all. Last fall, I asked Ken to pinch a seed head from that neighbor's parsley plant. I intend to plant those seeds this year and see if they come up. For nearly twelve years now I've had this problem growing parsley. I have the same problem with chives, but to a lesser degree. Maybe it's a soil thing. 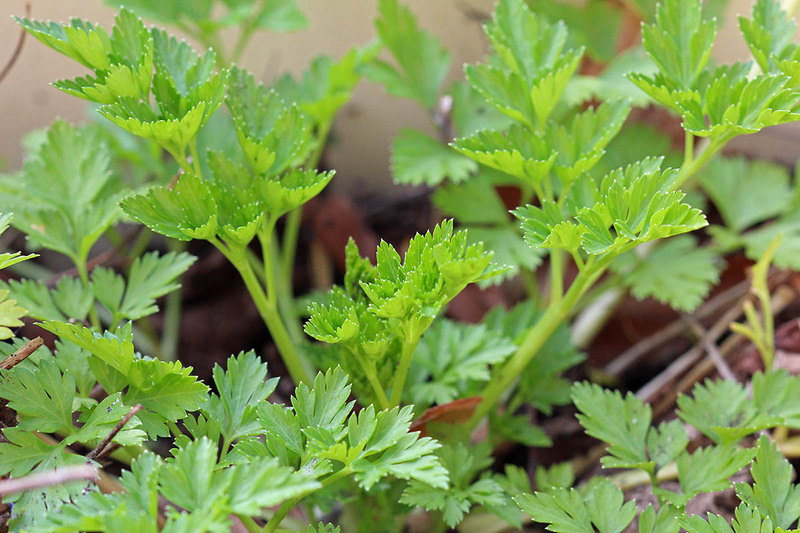 Cerfeuil (chervil) grows well in my garden, as does coriandre (cilantro). I sowed some sarriette (savory) last year and it worked, too. So, what's up with the parsley? 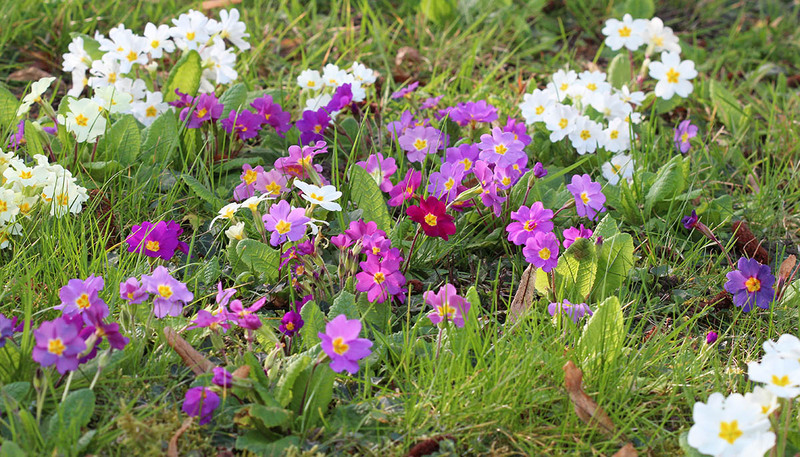 I think the primroses are at their peak right now. They'll go on for a few more weeks, but I'm sure I'll be cutting the grass (and flowers) soon. I haven't done that yet because it's been wet and a little chilly, and on the few good days we've had I've been doing other outdoor things. But it won't be long now. One red flower among the purple and white ones. Yesterday I cooked a chicken. I poached it with aromatic vegetables and then finished it off in the oven to give it a little color. I ate some with glazed carrots and French fries for lunch. Yum. Today I'm thinking of making a macaroni and cheese type casserole with chunks of chicken in it. 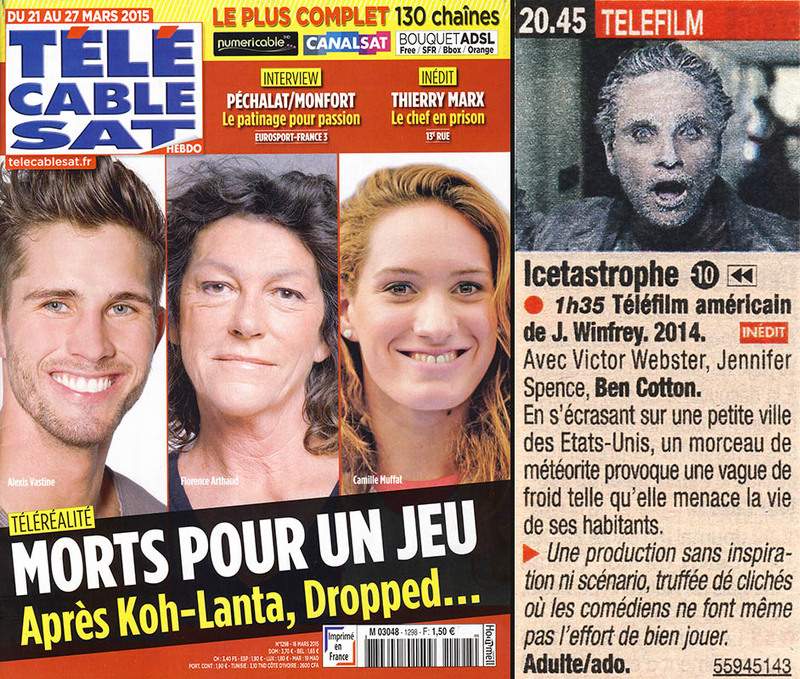 This is a sad cover with the photos of the three French athletes killed along with seven others in a recent helicopter accident in Argentina. The television news reports are now about the funerals and memorial services. I suspect that reality television has never been so real. Under the photos it says, "They died for a game." Another catastrophe: this time it's "Christmas Icetastrophe." I actually look these American films up on the internet to get their original titles and to read what they're about just to see how the French synopsis compares. This movie's title was modified to drop the word "Christmas," although I don't know why. It doesn't help. Similar to last week's disaster, this film features meteorites. Christmas Icetastrophe. American made-for-tv movie. Directed by J. Winfrey, 2014. First showing. With Victor Webster, Jennifer Spence, and Ben Cotton. When a piece of a meteorite crashes into a small American town, it provokes a deep freeze that threatens the lives of the inhabitants. ► This is a production without inspiration or a storyline, filled with clichés that the actors don't even try to make convincing. Because it's always nice to have a picture of Callie. She's been loving the nice weather these past few days. When she's not sitting in the grass, she's rolling in it. That, or chasing the tennis ball after I throw it, or tracking down lizards on the rock walls, or generally wandering around sniffing everything. 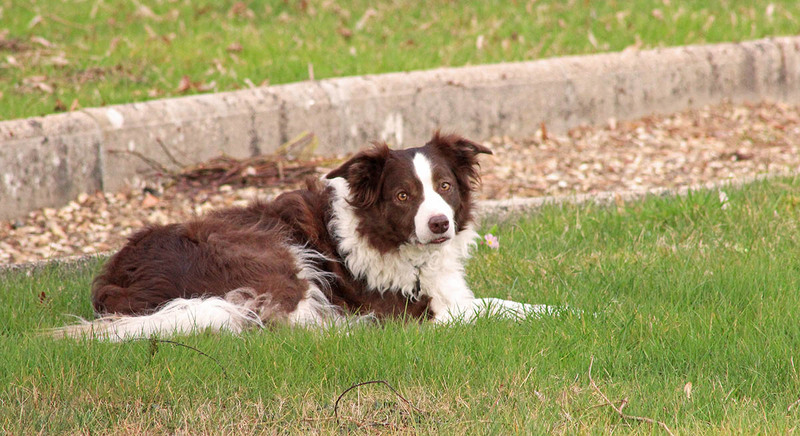 Callie resting in the grass while I took photos. Today I'm getting my haircut. I will be in the chair at the moment of the solar eclipse. It's not a total eclipse, but it will still be noticeable, from what I've heard. We're supposed to have relatively clear cloudy and drizzly skies, so it will be interesting. I'll see it on the news, of course. Bert's vet visit was good. He's ok in the carrying case, but he didn't like being in the car. Loud meows all the way. But once in the examining room he was a perfect gentleman. He got his shots and a worm pill and he has neither gained nor lost weight since last year. His teeth are good, too. I let him out of the carrier on the way home and he stood up with his paws on the dashboard, then the passenger door, looking out the windows the whole way. The primroses are putting on a show. They come up in the yard every spring with purples, whites, reds, and yellows. I kind of rushed this picture, so it is what it is. It won't be long before I have to run over them with the lawnmower, but I'll wait as long as I can. Purple primroses in the yard. Today Bert goes in to see the vet for his annual check-up and shots. Provided he sticks around in the morning, that is. He is usually there to get his breakfast first thing, but I will close him in once I feed him to make sure he doesn't wander off. The appointment is early, so he shouldn't have to wait indoors too long. After I had dug up the rhubarb over a week ago, I let it sit on the ground, thinking I had hacked it to bits and it would never come back. It rained for a few days, and then, later, I noticed bright red sprouts growing out of the mud-caked clumps. Once they dried out a little, I prepared their new home and transplanted about six new clumps. One of the newly transplanted clumps of rhubarb with fresh growth sprouting. So far, so good. The sprouts seem to be growing, so I'm hopeful. I know there will be no harvest this year, but that's ok. It was time to divide and move the rhubarb out of the larger garden plots for a fresh start. While our mornings are still chilly, the afternoons are getting nicer. I see daffodils in bloom all over, and the early-blooming trees are doing their thing. This is a plum tree on the corner of our property. Ken planted it from pits several years ago. 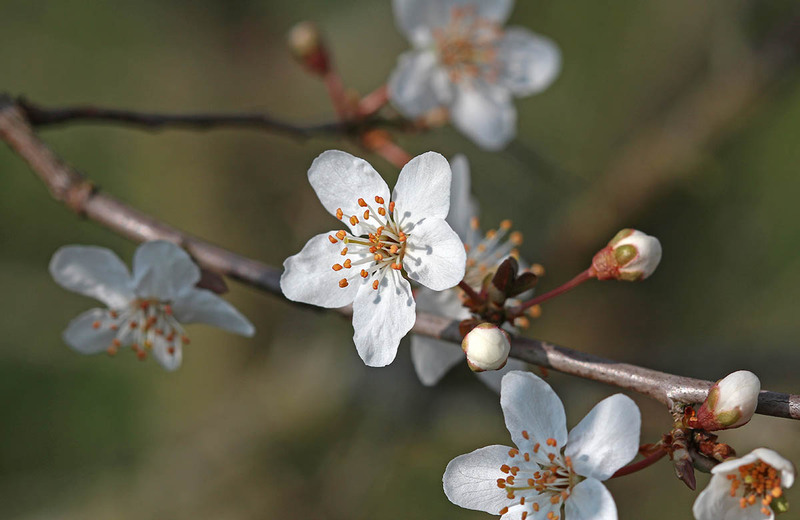 The white blossoms are opening now. Yesterday afternoon I dug up some jerusalem artichokes and relocated them to a bed in front of our garden shed. Of course, I had to dig out the bed to prepare it for the new flowers, but it wasn't hard.The bed is difficult because it's far from the garden plots and doesn't get watered as often (because I have to remember to do it), so I need some plants there that will grow like weeds and be able to take some neglect. The sunflower-like jerusalem artichokes should fit the bill. 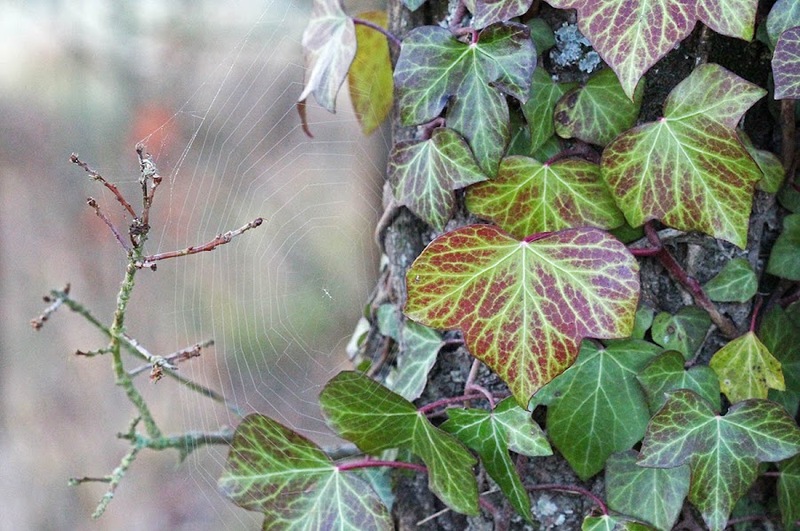 I was trying to get a shot of these ivy leaves clinging to a tree trunk when I noticed the spider's web off to the side. What looks like it could be the spider on the lower left edge of the web is actually a leaf bud. I never saw the actual spider. Look closely. The spider's web is on the left. This week is looking good, weather-wise, and I have a lot of chores I'd like to get done. Today I'm planning a run to the déchetterie (dump) to get rid of some stuff that's taking up space in the garage and utility room. Later, during the week, I want to get the living room windows washed, and the curtains, too. It's time to plant tomato, pepper, and eggplant seeds in little pots so they will be ready when it's time to plant them outdoors. And, if I'm real industrious, I will change the oil in the lawnmower, sharpen the blade, and cut the grass for the first time this year. I saw this unfortunate fellow the other day on the dirt road that runs near the pond behind the house. I'm sure we'll be seeing this a lot more in the next months as les crapauds (toads) come out of hibernation and begin mating. I've already heard some croaking around the pond in the mornings. They tend to quiet down when Callie and I walk close. Frog went a-courtin' and he did ride, uh-huh. Splat. 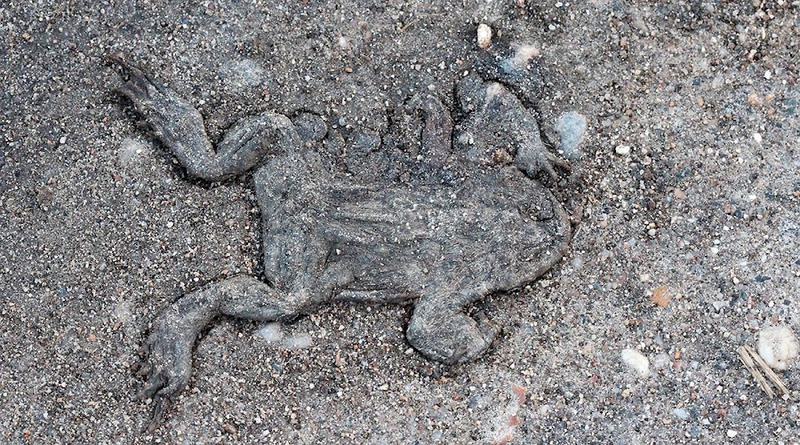 Inevitably, some of the toads will be on the road at the wrong time and get flattened. Poor things. When alive, they're good for the garden as they eat insects, slugs, and snails. This week our television magazine highlights one of my favorite genres: the documentary. The main article surveys a collection of this month's best docs, be they nature, science, sociology, or history programs. I'm looking forward to seeing some of these! We get many American and British adventure shows masquerading as documentaries. Bleh. But there is some good stuff out there. This week we have a disaster of a disaster film: "Meteor Storm." Meteor Storm. American made-for-tv movie. Directed by Tibor Takács, 2010. With Kari Matchett, Michael Trucco, Kirsten Prout, and Brett Dier. Meteors pound San Francisco. An astrophysicist is charged with dealing with the disaster while her husband directs the evacuation of the city's population. ► The storyline offers nothing new, the special effects don't work, and the actors all seem to be wondering what they're doing in this film. I mentioned last week that the full moon was setting in a place where I couldn't get a good shot. 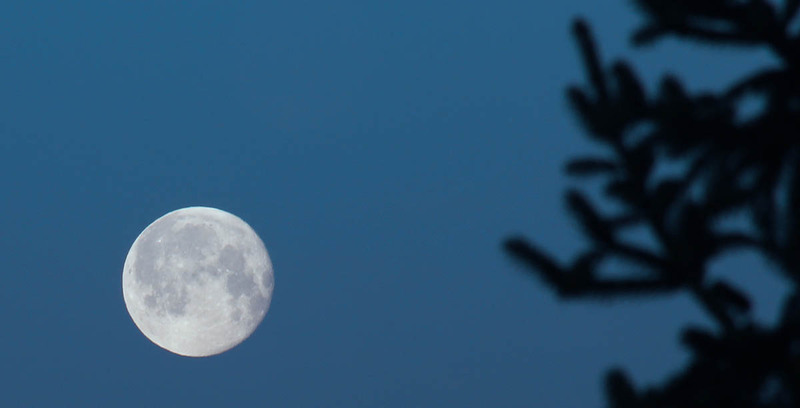 Two days after full, on Saturday morning, the moon's position had shifted and I got this photo out the bedroom window. The moon was just past full. Details: f/16, 1/30s, ISO 160, focal length 300mm. The sun had still not risen and the sky was that deep blue that you get in the twilight hour. I set the camera on its tripod with the zoom lens maxed out. As spring approaches, I notice a lot of shrubs and tree branches turning a dark shade of red. I wonder if it isn't the sap rising? Whatever it is, it means that the plants are preparing to blossom and/or put out leaves. The flowers on the forsythia in our garden are opening now, and the plum trees have fat pink buds on them. Notice the reddish tint in the lateral stems. It's more pronounced now than it has been all winter. 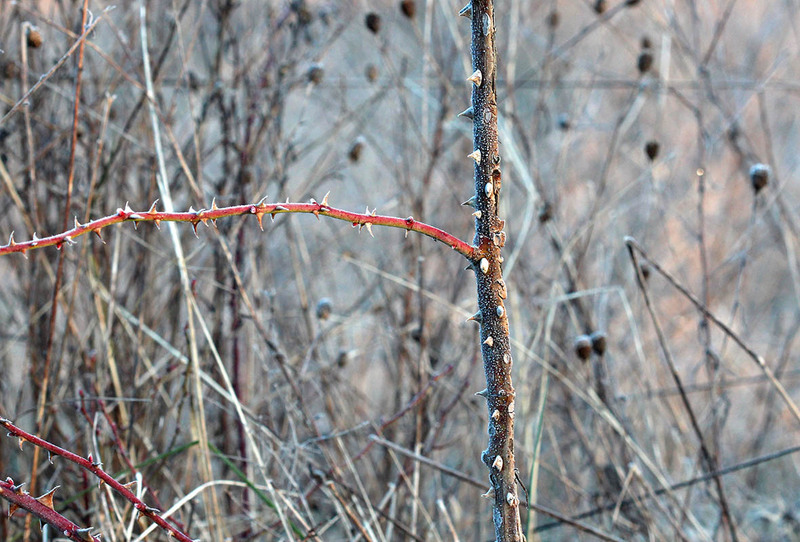 This is either a wild rose or blackberry out on the edge of a wood in between vineyard parcels. I think that its thorns are amazing looking. Today will be our last "warm" day before a weather system moves in, bringing temperatures back down for the weekend. I hope we don't get a freeze, but that is certainly a possibility this time of year. Get it? Ha ha. 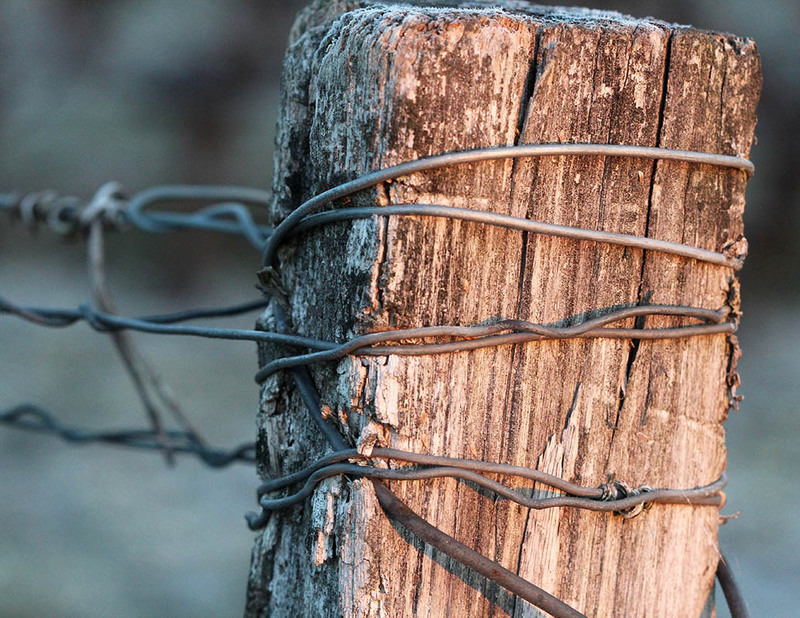 This is one of the "posts" at the end of a row of grape vines where the guide wires are anchored. These are thicker than the intermediate posts and usually driven into the ground at an angle for strength. In places where newer posts are made of galvanized steel, the end posts are still these bigger wooden ones. The rising sun shines on one side of this post. You can see frost on the top surface. I was surprised to hear rain on our roof windows last night. We didn't get much, but I wasn't expecting any. Callie heard something at four o'clock this morning and ran barking down the stairs, so I had to get up to see what it was and calm her down. As usual, I saw nothing. I was able to get back to sleep for a couple of hours. Last week we were still having morning low temperatures around freezing. 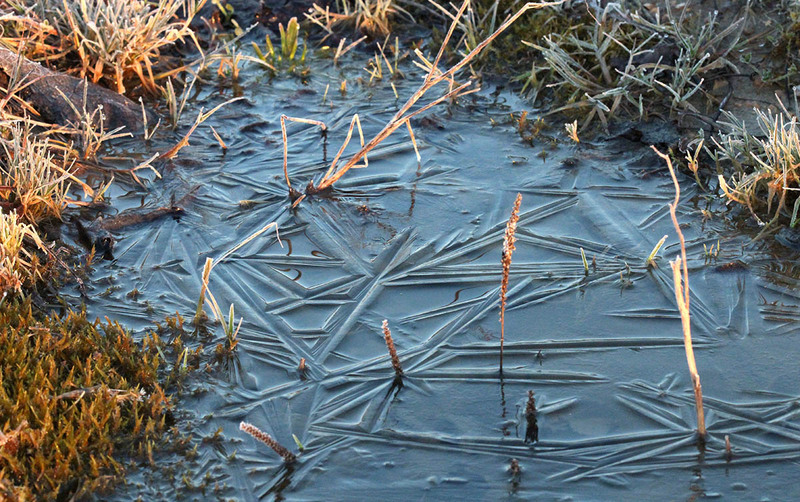 That meant frost, and sometimes a little ice forming on the puddles. It wasn't cold enough for the puddles to freeze through as they often do, but they started to before the sun came up and melted the ice. Ice patterns forming on the surface of a puddle. I dug up most of the rhubarb in the garden so that I can divide and relocate it. I did that last week. The ground was a muddy mess and I made a mess of the job. I didn't realize how deep the tubers had gone and ended up chopping through most of them with the shovel. But yesterday I noticed that a lot of the chunks have the beginnings of sprouts, so now I can see where to divide them and get them back into the ground today or tomorrow. I won't have usable rhubarb until next year or the year after, but that's ok. It happened over night. While I was sleeping. The sky covered over and there's no moon this morning. A quick check of the forecast shows all clouds for the next few days where yesterday it was all sun. Lovely. But no rain is predicted and it's expected to stay relatively warm. A recent sunny morning (not today) with fog in the river valley. I have no plan for what to get working on first while Ken is gone. On Sunday I moved the living room furniture and carpet and cleaned the floor. The spirit moved me. So we'll see what the spirit has in store today, other than tracking Ken's flight to the US on the internet. Callie was looking the other way, so I called her name and she turned her head around to look at me. That's a strange expression on her face! I liked the way she was back-lit in the morning sun. The grass was frosty, but we still ended up with muddy paws. 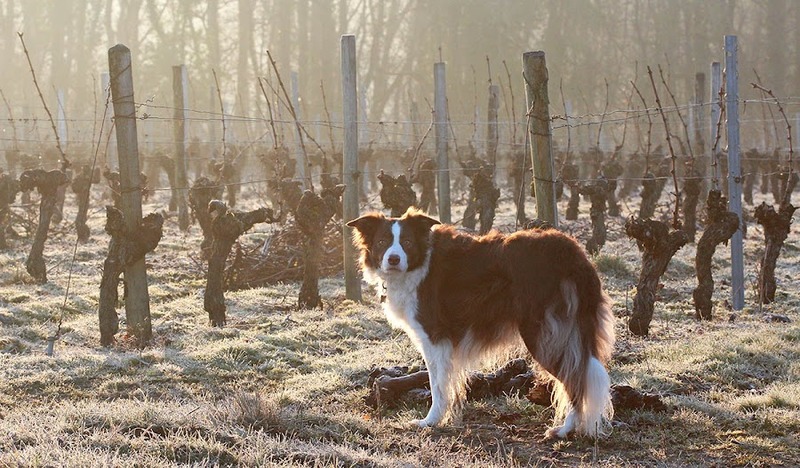 Callie in the vines. These vines have been pruned to a single cane. The canes will be bent over and attached to the guide wires before they sprout. Ken leaves today for Paris, then flies out early Monday morning for the US to visit his family in North Carolina. Callie, Bertie, and I will stay home and putter around. There's work to be done! It's Ted Danson! And his hair! Mr. Danson is a well-known American television actor who is also well-known for wearing a hairpiece since the early days. I remember him (and his toupee) most from his role as Sam Malone in the 1980s sitcom, "Cheers." Where everybody knows your mane. Rimshot. 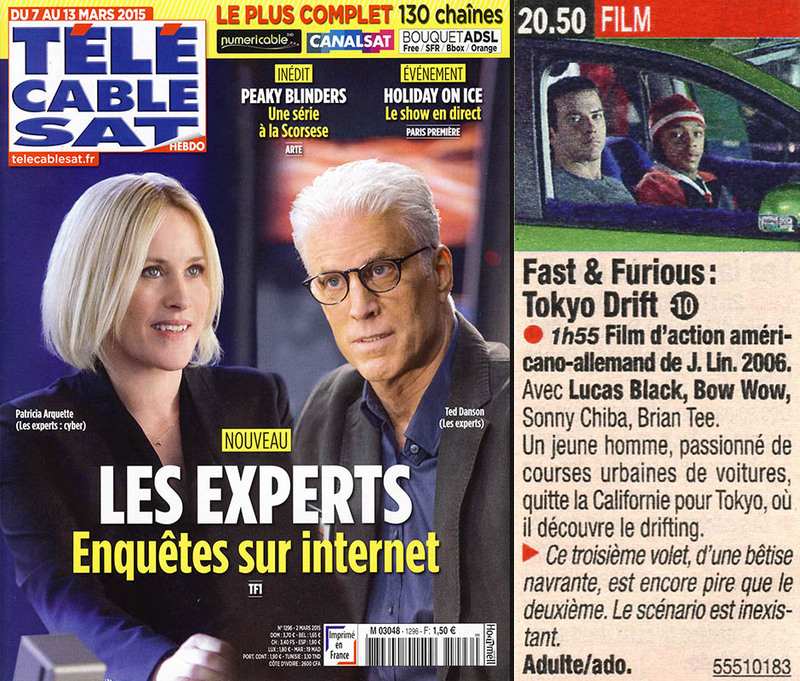 Ted Danson stars in "CSI: Crime Scene Investigations" which is called "Les experts" in France and, starting this month, Patricia Arquette stars in the spinoff, "CSI: Cyber." I've been in France long enough that I don't really know anything about the "Fast and Furious" thing, although I've heard of it. I read on the internet that there have been seven films in the series since 2001. Who the heck is Bow Wow? Fast & Furious: Tokyo Drift. American/German action film. Directed by J. Lin. 2006. With Lucas Black, Bow Wow, Sonny Chiba, and Brian Tee. A young man, passionate about urban street racing, leaves California for Tokyo where he discovers drift racing. ►This third installment, an unpleasantly stupid film, is even worse than the second one. There is absolutely no storyline. I think I used my allotment of o's and w's for the month in that title. This is one of the two new vineyard plots out back. The grapes were planted last summer. They still look like sticks stuck in the ground, but once they get their leaves this spring they'll be more recognizable. These little vines will need a few years before they produce enough grapes for production. The crew still hasn't finished installing the stakes and guide wires, but I don't think there's any rush. They'll probably get that done once the winter pruning is finished. We seem to be entering a stretch of nice weather. 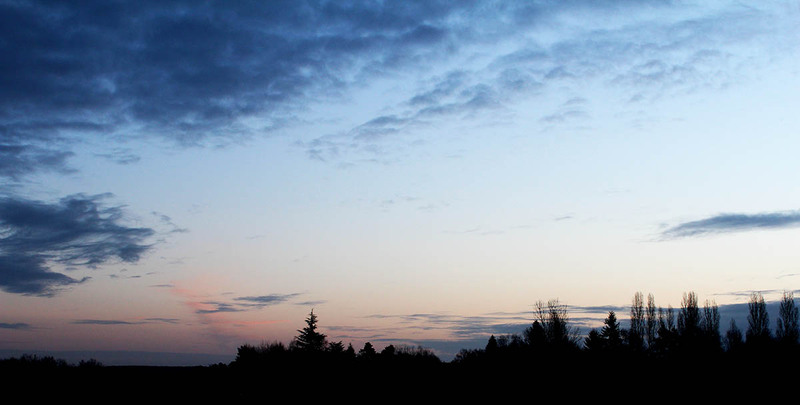 Clear skies and warming temperatures are predicted through the weekend. Nice! One of our neighbors was out on Wednesday cutting his grass. I think it's still too early to do that; the ground is still very saturated and there are mole hills everywhere. Looking northeast. The sun rises in the east-southeast this time of year, to the right of the frame. The skies are pretty in the morning now, especially with today's full moon setting. Unfortunately, it's setting in a spot where I can't get a clear shot from the house with the camera. And I'm not adventurous enough to go outside with the tripod at six-thirty, especially with the temperature down close to freezing. Maybe next month. Or the one after that. I was (again) experimenting with the camera and took some photos from the den window on Tuesday morning. This is part of the view; it's a long shot with the zoom lens. 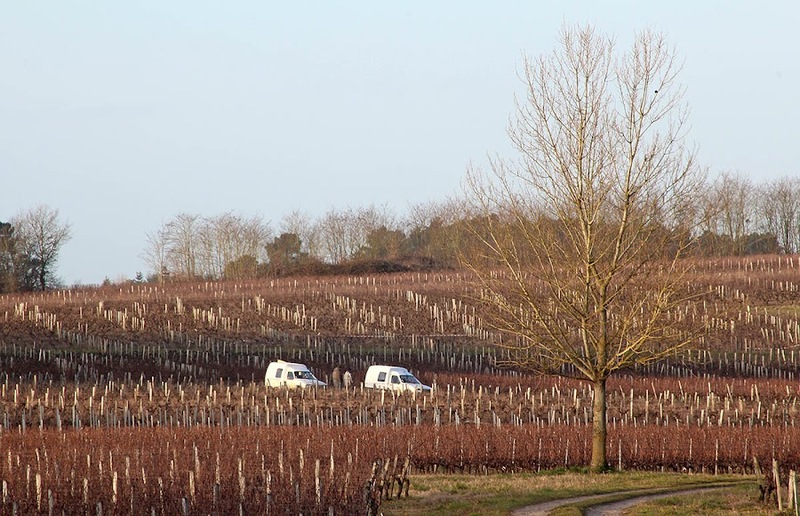 The vineyard team had just arrived and were getting ready to start the day's pruning. Ken and Callie were out there somewhere (but they're not in the picture). Details: f/20, 1/15sec., ISO-200, focal length 260mm. I used a tripod with a 2sec shutter delay. I'm thinking about a new camera. I've had the T3i for almost three years, and now I'm itching to upgrade to a full-sensor camera (the current Canon is a cropped-sensor camera). I'm still in the research stage at this point and not yet ready to buy. If any of you out there have experience with full- vs. cropped-sensor DSLRs, I'd appreciate hearing what you think. 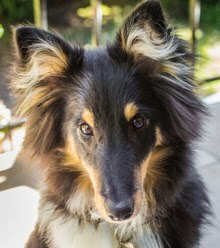 My issue with the camera is image quality. I've never been completely satisfied with the clarity of my shots with this camera. I expected better when I upgraded from the bridge camera to the SLR. Now, I know it could be me and not the camera, but I've worked for nearly three years on this problem (shooting technique, upgraded lenses, and post-processing) and can't seem to lick it. I normally shoot in full manual mode and occasionally use automatic or shutter/aperture priority modes for comparison. I don't shoot in RAW mode, but that shouldn't be necessary since I don't normally enlarge or print my photos. I'm not trying for high-end professional quality, but I do look at a lot of photo blogs on the internet and am often envious of the beautifully crisp and tack-sharp images I see on many of them. My photos often seem fuzzy to my eye. So I have to wonder, is it me or is it the camera? Not far from the piney woods is this stand of very tall pine trees. You can't see it in the photo, but there's a paved road just in front of the trees that meets up with the dirt road that Callie and I usually walk in the morning. The intersection is toward the right, just outside the image. 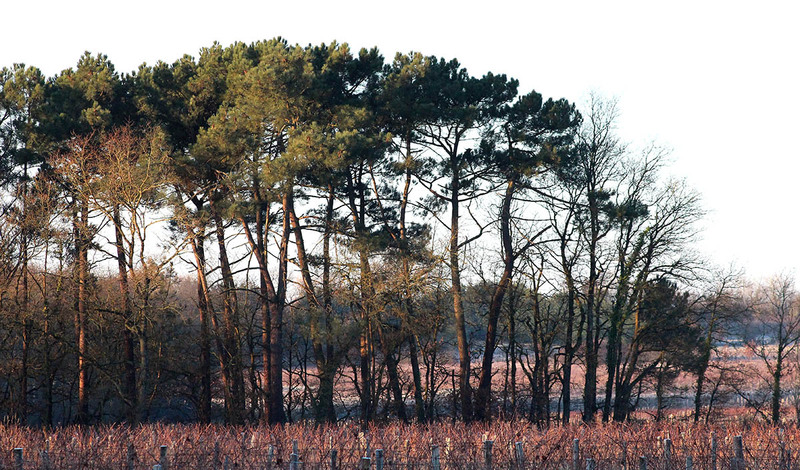 Big pine trees among the grape vines. Little signs of spring are popping up here and there. 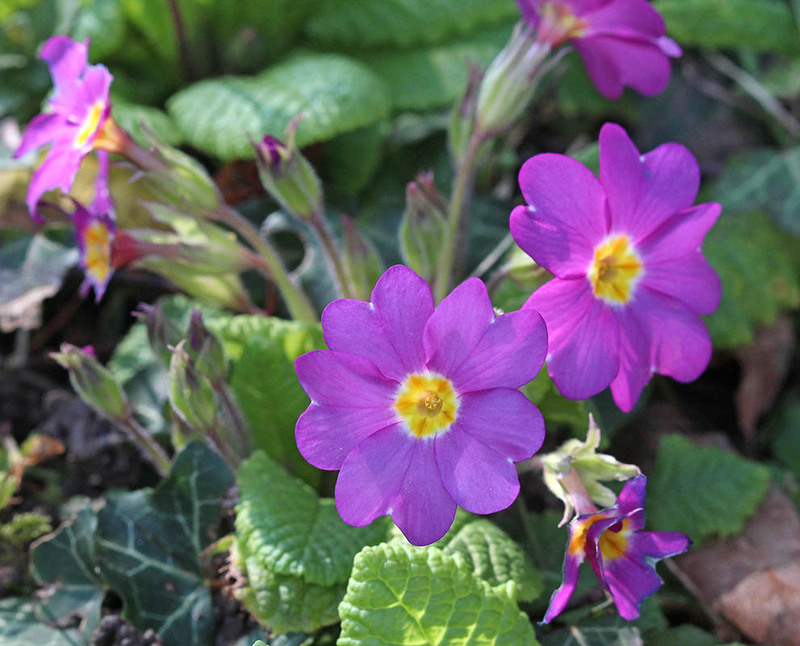 We have cyclamen blooming in the yard and the primroses are starting to flower. I can see buds fattening on the trees, although leaves are still a month or so away. Our weather is consistent with typical March weather so far; series of squalls called giboulées are moving through, although they're not yet very strong. In France, the March squalls are called les giboulées de mars. In the US (and the UK, I think), they're the same as what we call April showers. Reminds me of a childhood riddle: If March winds bring April showers, and April showers bring May flowers, what do May flowers bring? I planned to make some pizza dough one night this past week, but when it came time to do it, I didn't feel like it. So Ken decided to make une fougasse (focaccia bread) the next morning and dress it up with pizza toppings for lunch. 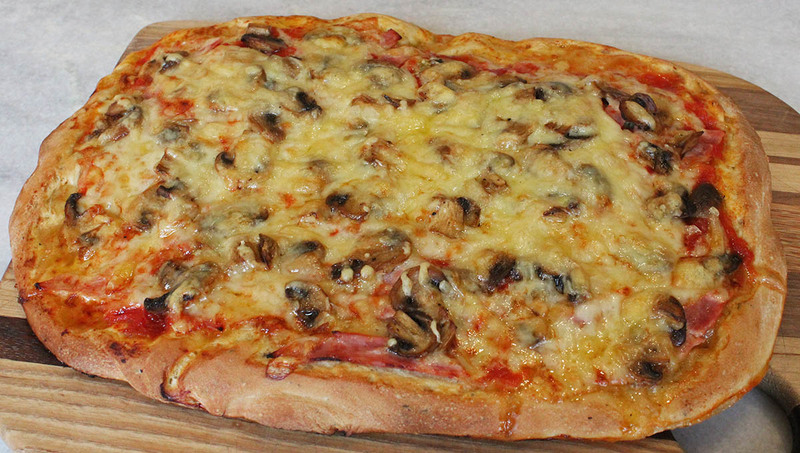 His dough included herbs and olive oil and we topped it with tomato sauce, garlic, ham, mushrooms, and cheese. 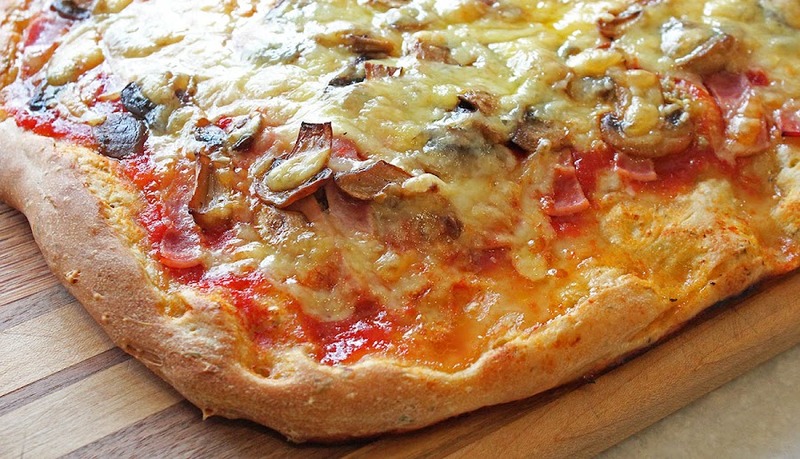 It looks like a pizza, but it's not. It was delicious! The bottom of the fougasse was crispy while the inside was tender. And the toppings turned it into a meal. It made a nice change from the pizza we usually make. 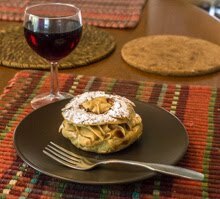 Our plan was to have a green salad after, but the fougasse was so good that we ate the whole thing, then didn't have room for the salad. Oh well. The dough was thicker than it looks in the photos, with a nice bready texture inside. Many of the growers around us make use of old mineral water bottles in their vineyard parcels. 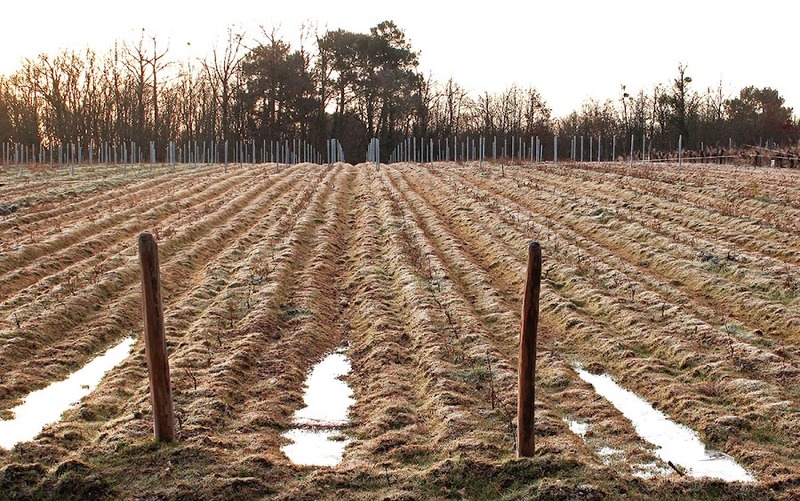 They cut the tops and bottoms off and fit the bottle over young vines that are replacing older vines in an established parcel. I suppose that this not only protects the vine from critters but also makes a little greenhouse effect, shielding the young shoot from wind and cold. But I'm only guessing. Water bottles seem to glow in the morning sun. I cleaned out under our carport on Saturday. It's the place where I cut and store firewood and kindling each year. But not any more. Now it will be home to the old Peugeot as the other car takes its place in the garage. If all goes according to plan, I won't be cutting much wood in the future. We want to replace our wood burning stove with a wider model to accommodate 50mm logs. That length is more readily available from wood vendors whereas the 33mm logs we use now are not (or if they are, they're more costly). That's one of a few summer projects we have in mind for the house. Stay tuned.